You have stepped out and faith and started that business God showed you was His will for you and almost immediately you are bombarded with customer complaints and false accusations. You make the decision to tithe in faith, even though it seems to make no sense because of your already strained bank account. You write that tithe check and sow it in love and faith, and then – WHAMMO – your car and washing machine break down at the same time! You have been wanting to make a career change and, after much prayer, you believe God has said, “Go for it!” So you take that new position, hopeful and in faith, and the company bankrupts right after you start and you are now looking for another job. Well, the human reaction is to react, to lash out, and to cast away our confidence. The natural reaction is to scream “God! I trusted You. I thought I was doing what YOU wanted me to do; why did it go wrong?” My favorite line is “Good girls are supposed to get the reward!” What do you do when you are doing good, walking the right path, sowing into the Kingdom, yet you are attacked and don’t get the reward? One: You must know the enemy does not want you following God’s plan! He wants to steal the love and Word of God from your heart. He will do anything in his power to stop you. He will send people onto your path to assault and offend you. As the prince of the air, he will cause all sorts of technological troubles for you. He will do whatever it takes to FRUSTRATE and DISCOURAGE you to get you to give up. We must know this; we must know our enemy and be aware of his methods. Three: Allow yourself the time to get from One to Two! Don’t beat yourself up if your first reaction is “Ouch! God! This hurts and I am angry and hurt!” Just don’t stay in that mode. Five: Submit yourself to God, resist the devil and he will flee from you. James 4:7 At some point, the devil will take a break because he sees your persistence and perseverance. Notice that is says “have overcome”! That means you already have the victory, no matter the attack! 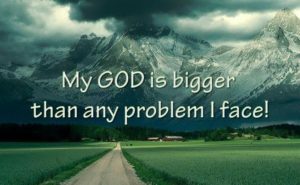 God is bigger that it all!